Here's our list of beautiful Arabic baby names and their meanings. South Africa, meet Khalid Parnell - first-time parents Aisha Baker and SA cricketer Wayne Parnell's beautiful baby boy! 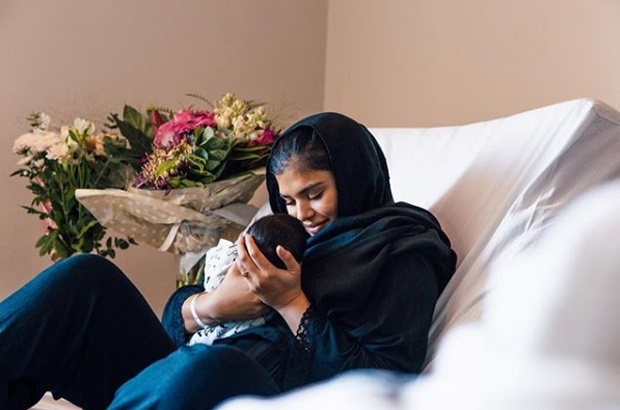 The blogger mom explained on Instagram that her bundle of joy was "named after the great Khalid ibn Al Walid, a warrior in Islam, a revered Muslim and companion of the prophet (SAW)". "Ibn" in Arabic means the "son of", which therefore means Khalid was the son of Walid, who was also a warrior in Islam, and Walid is also the name of Aisha's husband! Coincidence? Hmmm. And if that wasn't already majestic enough, we looked up the Arabic meaning of Khalid and found that it also means one who is "eternal", "everlasting" - a truly magnificent name for her beautiful baby boy. Most incredible moment of my life giving birth to our little Prince Charming. Thank you to everyone who sent regards, gifts and messages. Feeling blessed beyond measure to be given the gift of motherhood! Baby and I are doing well with the support of the best dad and partner ever @parnygram ????? wishing everyone well over the fast inshallah - please keep us in your prayers ?? Also read: Aisha Baker was "poep scared of giving birth"
We know that choosing a name for your little one who, from the very moment you meet, brings so much joy into your life, isn't the easiest task in the world. We're sure Aisha and Wayne also took their time while she was pregnant choosing their little one's name. And if you too have a little one on the way, you might be feeling somewhat overwhelmed looking for the perfect baby name. But if it's specifically a beautiful Arabic baby name you're after, you've come to the right place. We've rounded up a list of both girl and boy baby names and their meanings for your perusal. Take a look! Meaning: Name of the angel Aaban. Meaning: Just; honest; equal; upright. Meaning: Exhalted; highest social standing. Meaning: Daughter of Sa'd who was queen of Iran (AN). Meaning: Doer of good deeds. Meaning: Knowing; woman who recognises Islam. Meaning: Person who keeps away from sins. Meaning: Description of a lion. Meaning: Servant of the One. Meaning: A mighty ruler, judge, protector; one who doesn't render deed worthless but compensates. Meaning: Son of the prophet Ismaeel; one who settles in a place for a long time. Meaning: Guest; the one who is returning. Meaning: Wife of the Prophet Muhammad (PBUH). Meaning: Shine like a star. Meaning: Life; vivaciousness; living prosperous, youngest wife of the prophet (PBUH). Meaning: Wise; learned; learned in music and dancing. Meaning: Long-living; one who brings a place back to life. Meaning: Beautiful; exhalted, high, great. Meaning: Name of a prophet. Meaning: Bearer of glad tidings; bringer of good news. Meaning: Satisfies thirst; name of the Prophet's muezzin (one who calls for prayer). Meaning: Good-mannered; lady-like; intelligent; perceptive. Meaning: Name of a prophet (David). Meaning: Name of a prophet (Abraham). Meaning: The Arabic translation of Jesus. Meaning: Name of flower in heaven. Meaning: Excellent; so good that it makes you proud. Meaning: One who can distiguish between right and wrong. Meaning: Praised; one who praises. Meaning: Brother of prophet Moosa. Meaning: Brave destroyer of evil. Meaning: Father of multitude; a prophet's name (Abraham). Meaning: Kindness; beneficence; highest level of faith. Meaning: Pillar of strength; support; confidence. Meaning: Guiding hand, guidance, direction. Meaning: Son of the prophet Ebrahim (Abraham). Meaning: Reward; to create good change. Meaning: Wife of the prophet. Meaning: Beautiful night; woman of the night. Meaning: Wise; some say it was also the name of a prophet in Islam. Meaning: Arabic form of 'Mary', mother of Jesus. Meaning: One who is blessed with piety. Meaning: The name of an angel. Meaning: Giver of advice, admonition and protection. Meaning: One who responds to someone who asks for help. Meaning: One who constantly turns to Allah. Meaning: beautiful; radiant; glowing with happiness (particularly in reference to a woman's radiant face). Meaning: Chosen; One of the prophet's names. Meaning: Companion, confidant, friend; Repentant. Meaning: To flourish or to thrive. Meaning: Kind or compassionate friend. Meaning: Kind; to show mercy. Meaning: Luxuriant; one of the gates of paradise. Meaning: Pleased, content; devoted to Allah. Meaning: Wife of a prophet (Ebrahim); pure. Meaning: Beautiful; bright like the morning. Meaning: Queen-like; noble; leader; the best of the best women. Meaning: One who shows the right path. Meaning: Truthful, loyal, devoted, a true friend. Meaning: To strike; night visitor. Meaning: to agree or reconcile; the ability or opportunity to achieve success. Meaning: Someone who always remembers Allah. Meaning: Name of the second Caliph. Meaning: Name of the third Caliph. Meaning: Precious; also thought to be a prophet in Islam. Meaning: Describer; one who praises. Meaning: Reunion; when lovers meet. Meaning: On the right, right hand. Meaning: Name of a prophet (Jacob). Meaning: Name of a prophet (Joseph); god increases. Meaning: Beautiful, bright, shining; flower, blossom. Meaning: Flower of the desert. Meaning: To add or to increase. Meaning: Strong, powerful; intelligent, wise. Henry Charles Albert David, Rachel Meghan and more royal baby names! Please help us fill out the list by emailing more names, meanings and corrections to babynames@parent24.com.